One week post Ironman, I somehow found myself in Mercer County, NJ for the New Jersey State Triathlon. Now, this was no ordinary race – it was the club championship! How could I not participate? DC Tri has held the USAT-MA Club Championship title for 3 years in a row! Not to mention, this race was our key race for all our New Triathletes (including my mentee). So, I joined over 210 of my fellow club members Sunday morning. For the first time, I can tell you I did not compete in a “full” triathlon [many people seem to think that only an Ironman is a full triathlon, but doing all three sports in any of the four distance segments really constitutes a full tri]. I participated in the swim portion of an Olympic distance relay with my friends Nikki and Rachel. 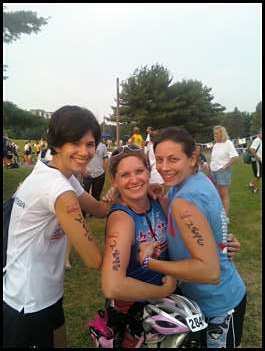 We three, the DC Tri Chix, were ready for some competition! And, it just so happened that our friends Travis, Joe, and Katie were lined up for a relay too. The odds between us were good – Joe and I were both coming off Placid and the other four were coming off the NYC Olympic Triathlon the week before. Could I make it through the swim without flashbacks of being dunked? Would Nikki prevail ov er Joe’s tired legs on the 25 mile ride? Would Rachel be able to set her PR on the run? 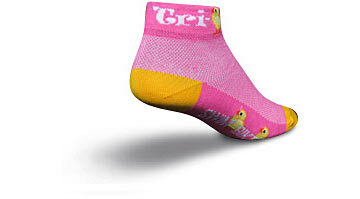 Maybe it was the “tri-chic” socks I special ordered…or all the smack talk in the car on the way up to Jersey Saturday…or the pre-race beer Saturday night, but we were ready on Sunday morning. The swim felt a lot longer than 1.5k – especially in the warm water where no wetsuits were allowed. I made it out of the water just before Travis, then we handed off the timing chip to Nikki to crush it on the bike. Nikki and Joe were neck and neck until the end, when Joe took the lead. Katie led the way out of the transition on the run, but Nikki and I were jumping with joy to see Rachel speed by her by mile 3 of the run! We the Tri Chix took home second overall in the relays! To add to the triumph, the DC Tri Club dominated the race course with both competitors and volunteers, and captured our 4th consecutive USAT-MA Club Championship! And then the tragedy sets in…. While the race was coming to close in the early afternoon, the search for a missing swimmer was well under way. Robert Hogood, 52, had been competing in the Sprint race and unfortunately never made it out of the water. His death is one of several swimming deaths in triathlons in recent weeks. It is definitely a reminder about the dangers of the sport.